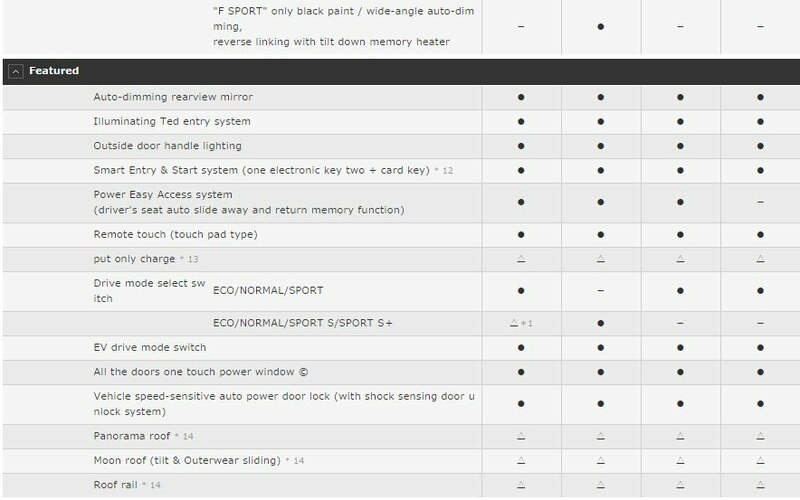 If you select the NAVI · AI-AVS, drive mode select will be ECO / NORMAL / SPORT S / SPORT S + 4 mode. 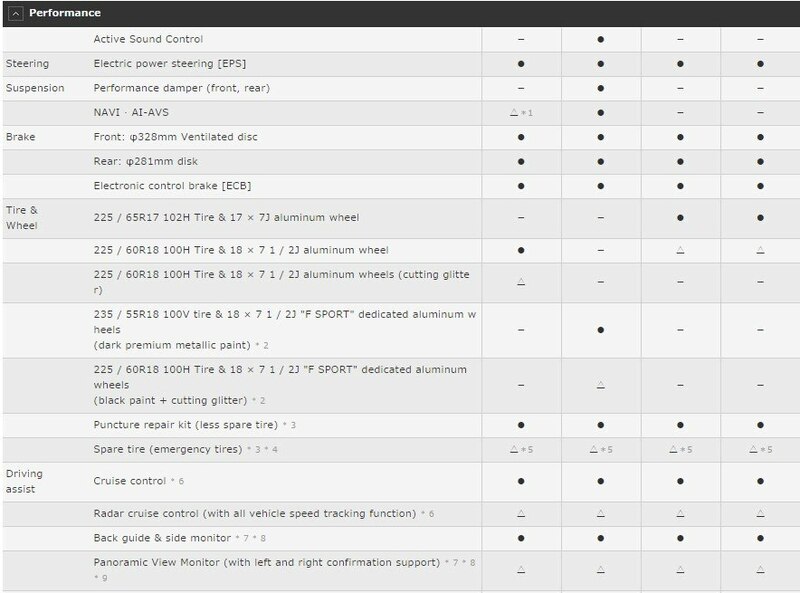 235 / 55R18 tire & "F SPORT" dedicated aluminum wheels (dark premium metallic paint), 225 / 60R18 tire & "F SPORT" You can choose either a dedicated aluminum wheels (black paint + cutting glitter) Feel free to. Puncture repair kit (less spare tire), you can choose either of the spare tire (emergency tires) Feel free to. If you select the spare tire (emergency tires), different shape and material of the deck under box. 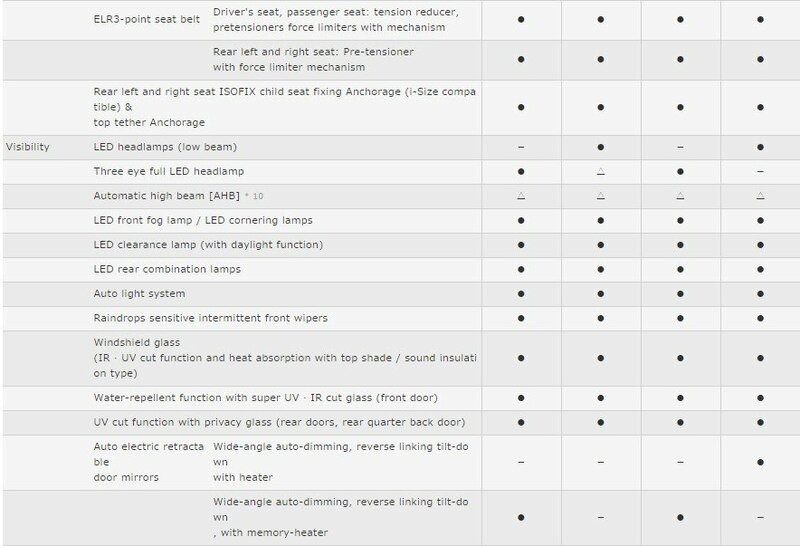 It can not be selected spare tire (emergency tires) and accessories outlet the (AC100V · 1500W / center console rear) at the same time. If you select a pre-crash safety system (millimeter wave radar system), cruise control will be radar cruise control (with all vehicle speed tracking function). If you select a panoramic view monitor (with left and right confirmation support), back guide & side monitor can not be installed. Shaped light license plate can not be installed simultaneously. Panoramic View Monitor and (with left and right confirmation support) blind spot monitor [BSM] will be installed simultaneously. In addition, you can select only if you have selected the clearance sonar & back sonar. Lane Departure Alert [LDA] (with steering control) and automatic high beam [AHB] will be installed simultaneously. If you are using a device such as a implantable cardiac pacemaker, because it may affect the medical electrical equipment by radio waves, left side of the vehicle, and implantable cardiac from the originating antenna within about 45cm, which is mounted in the front and rear of the wheel house Please do not close the pacemaker. If you are using a device such as a implantable cardiac pacemaker, because it may affect the medical electrical equipment by radio waves, that you do not close the implantable cardiac pacemaker to within about 22cm from the transmitter that has been mounted on a vehicle give me. Please consult your Lexus dealer so you can also stop the radio transmission. If you are using a device such as a implantable cardiac pacemaker, just before using the charge put please well consult a doctor. Charging operation may affect the medical electrical equipment. Please consult your Lexus dealer so you can also stop the charging function. If you select a panoramic roof, moon roof (tilt & Outerwear sliding), you will not be able to select the roof rail. 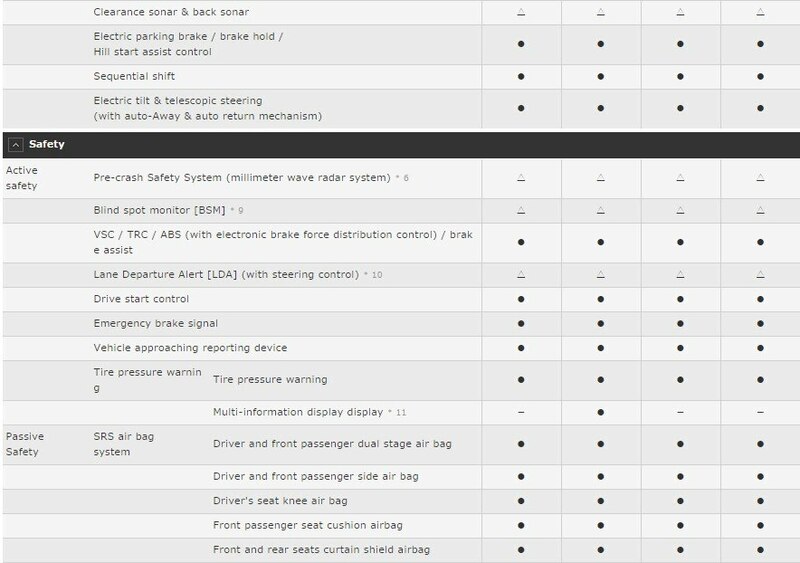 This can be selected only when you select Lane Departure Alert [LDA] the (with steering control) and automatic high beam [AHB]. Steering heater and the driver and front passenger seat heater will be installed simultaneously. L tex (El Tex) is a synthetic leather in pursuit of texture and feel close to the leather. I am using a synthetic leather to part of the sheet. You might not be able to play by the disk. VTR cable is separately required for use. Please ask for details on the Lexus dealer. This service only to customers who have received your purchase a new car · CPO (certified pre-owned Lexus cars), you will be offered. You requires a separate agreement to use. G-Link basic usage fee will be charged for three years after the new car registration (only to customers who have received your purchase a new car). 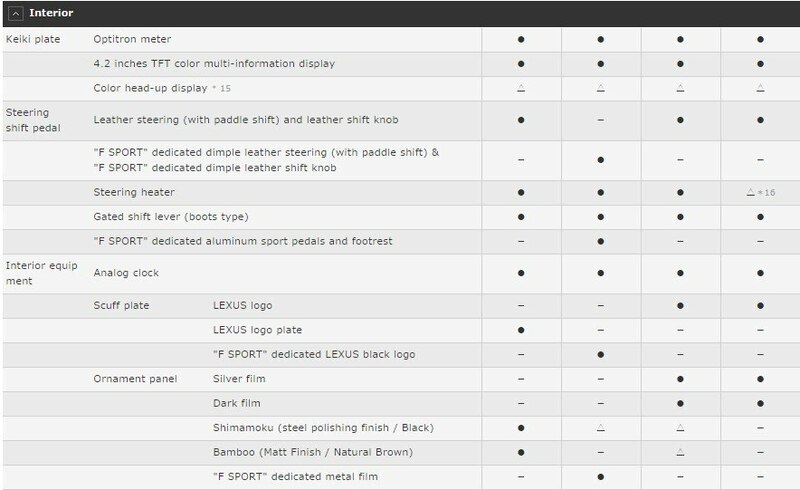 The subsequent fourth year of available procedures and G-Link basic usage fees, please contact us to Lexus dealer. not be available in places where radio waves can not reach. Operator service Bluetooth ® you can hands-free connection to compatible mobile phone, without having to the contract of automobile-only hands-free phone, can you just use to select the "Owner's desk" button. Than new car registration date three years available. By purchasing the latest map software later, available for two years from the date of purchase. The automatic update by communication requires a contract of G-Link. When there is no contract, updating of the map SD card with map updates and PC applications by the media (CD-R / DVD-R / USB memory) are available. Subject of map update, national highway, toll road, the main national road and highway facilities and toll road facilities, and some national and major roads, the capital of home around 80km square and destination around 10km square that has been set to the navigation prefectural road and other roads, road width is 5.5m less than the road and three-dimensional landmark equivalent of prominent facility (city view, voice guidance data outside updated). General Facilities information such as a convenience store will be updated only facility symbol. It should be noted that, by the collection / development status of map update data, it may take about three months before delivery. Setup cost is required separately. Please ask for details on the Lexus dealer. Please use the following electrical products 100W. However, there is an item you want and be careful if you do not normally operate in the following electrical products 100W. Please be sure to look at the product of handling manual before you intend to use. If in some areas that were running the engine in the vehicle is stopped, you may be subject to penalties touch the ordinance so please enough attention. Please use the following electrical products 1500W. However, there is an item you want and be careful if you do not normally operate in the following electrical products 1500W. Please be sure to look at the product of handling manual before you intend to use. 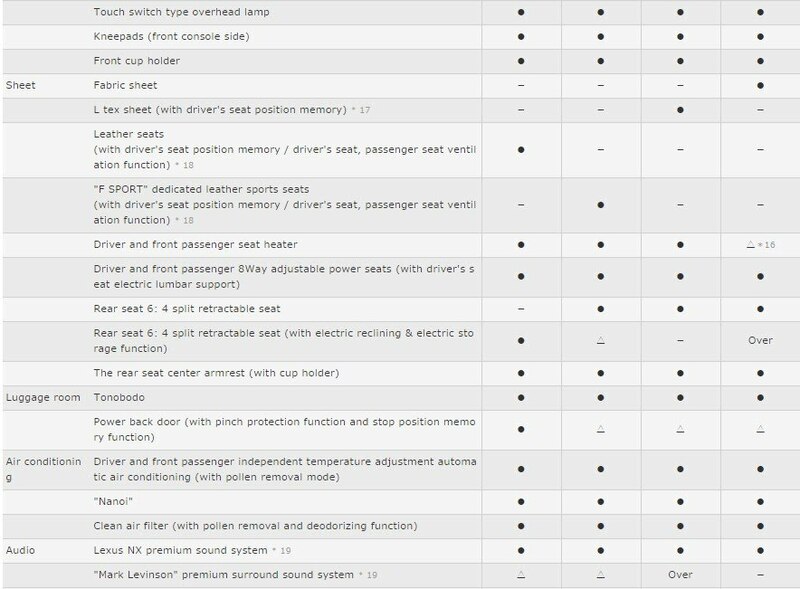 Please contact your Lexus dealer with regard to frequency switching (50Hz / 60Hz). If in some areas that were running the engine in the vehicle is stopped, you may be subject to penalties touch the ordinance so please enough attention. In cold weather model with the aim to enhance the equipment that takes into account the use of in cold climates. In addition, the rear fog lamp is mounted, lighting state of the tail lamp will change. In addition, Hokkaido district cold weather model is the standard equipment. "Manufacturer option" I will be charged at the time of your order. For mounting at the manufacturer's plant, please acknowledge after your order we can not accept. "Version L" "F SPORT" "I package" is not a grade name. Mark Levinson are trademarks of Harman International Industries, Inc..
Bluetooth ® is a trademark of Bluetooth SIG, Inc..
G-Link is a trademark of Tokyo Gas Co., Ltd., we are used under license. "Nanoe" "Nanoi" and "nanoe" mark is a trademark of Panasonic Corporation. "Help Net ® "is a registered trademark of Nippon emergency services. "Put only charge", "put only charging" logo is a registered trademark of NTT DoCoMo.